The most thrilling moments of a relationship are often the scariest. We all crave having someone to experience the highs and the lows with, and to share our biggest dreams with. However, it can also be terrifying to invest that much of ourselves in one person. If the relationship ends, we could lose not only that special person, but also that portion of ourselves that was given to them. Or could we? I don’t believe that if you give away something that precious, it’s ever lost. Strong connections shape who you are. Opening yourself up and being vulnerable is the number one way to create intimacy in a relationship. At the end of the day, we all desire and need intimacy (well, at least I do…). Our need for intimacy goes back to the womb. Physical and emotional intimacy is key to strong, trusting, healthy relationships. Without it, our relationships feel unfulfilled. Have you heard any of these reasons for breakups before? “He just started to feel so distant” or “She started to resent me“. I bet these could probably be traced back to a lack of intimacy in the relationship. So, how do we become intimacy masters and have fulfilling relationships? In the 1990’s, a study was conducted called “The Experimental Generation of Interpersonal Closeness.” The study found that two individuals can quickly become very close by simply being vulnerable – even if they’ve only just met. The individuals in the study asked each other a series of 36 questions. These questions delved a bit deeper into the other person’s psyche than your standard, “Where did you grow up?” they also required a bit more thought. Some examples included asking the other person what their idea of a perfect day was, what their favorite memory was or who they’d like to invite to dinner if they could invite anyone in the world. “Oh, you’re from Iowa? My favorite childhood memory is of spending a summer on my Aunt’s dairy farm…“. It could start a conversation about your childhoods and allow information to be divulged comfortably and appropriately. You need to have a nice “give and take ratio“. You give some information, you get some information. Sharing is an important part of relationships. You shouldn’t be giving more than you’re getting and vice versa. Be open with each other. Allow yourself the opportunity of being vulnerable within reason, and see where it takes you.  Plus, great texting conversations will simply give you more topics to elaborate on the next time you’re face-to-face. It’s important to note that honesty is really important here. If you’re texting, it might be easier to lie. They’re not reading your body language or tone of voice, and you have ample time to come up with a good answer. This might make it easy to exaggerate the truth a bit, but don’t. Always tell the truth! A big part of being vulnerable is being comfortable and confident with who you are, so don’t dress up your stories and personality to come off a certain way. Just be you! The same goes for when you’re ready to start sharing your feelings. Texting, “These last few weeks have been great! I’m excited to see what comes next” may be your first stab at an emotional text in a new relationship. Go ahead and send it! It might be scary but, by being open and honest, you’re giving your relationship the best chance to succeed. Studies show that when we express our feelings directly, we learn to overcome emotions faster. What else can give your relationship another layer of intimacy? Laughter! Luckily, we have plenty of ways to express that we find something funny via text: emojis, LOL’s, haha’s etc. So don’t hold back! As a natural uplift, laughter is good for you. If you’re laughing with your partner, even via text, it’ll be good for the both of you. When we laugh together, we feel closer. Think about it. We all have different senses of humor. What one person finds funny, someone else might not. So when two people find something commonly hilarious, it means their personalities are in line. If we laugh together, we have the sense that we understand each other. This creates intimacy. Don’t hold back on the LOL’s and the crying-laughing emoji. Your relationship will thank you for it! While it’s true that some things need to be done in person, our typed conversations to each other can create an ample amount of intimacy as well. It’s all about getting to know someone – their interests, their feelings, and what makes them send “LMAO.” Hopefully it makes you LOL too. Being vulnerable…it’s worth it. If you really want to up your text game, sign up for the Free 30 day Texting Club trial with over 300 messages!